One of the largest and world's most famous fashion houses. 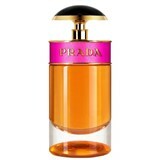 Prada is synonymous with luxury and first class. A legacy of success that translates into the highest quality products for the most demanding customers. Unforgettable aromas in small elegant bottles and with chic design. Prada - A brand on top of the world!